U.S. mortgages in foreclosure rose in April 62% from a year ago according to RealtyTrac Inc. Folks are increasingly losing their homes as we warned last October. Attempting to allay fears, Federal Reserve Chairman Ben Bernanke spoke last Thursday: "We believe the effect of the troubles in the subprime sector on the broader housing market will be limited and we do not expect significant spillovers from the subprime market to the rest of the economy or to the financial system." We clearly disagree. Credit Suisse’s ARM Reset Schedule, included in our last report, shows that over $1 Trillion dollars worth of adjustable rate mortgages will reset over the next 5 years. Bloomberg is just now reporting on the extent of the subprime meltdown. Even more telling is what credit derivative market charts are showing. The credit derivative index, ABX.HE, prices the cost of default insurance on U.S. mortgages. 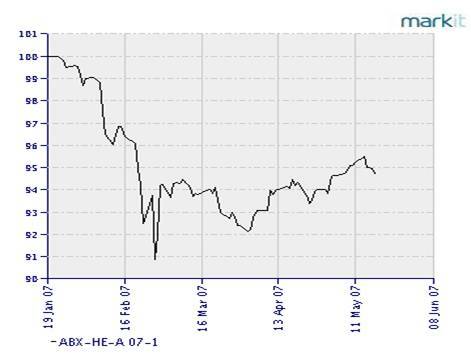 For instance, the ABX.HE falls in value if the risk increases that a pool of mortgages will default. During the February subprime panic, BBB and BBB- (or subprime credit) derivatives collapsed. This is evident in the chart below from Markit. According to the Federal Reserve Bank of Cleveland’s economists, “That’s a 29 percent drop in only one month. Since then, there’s been a rebound, up over 10 percent, but the market seems to be anticipating continuing large losses in the subprime market.” According to their analysis, subprime troubles won’t be limited to the February panic. After looking at the chart below, ‘spillover effects’ are also evident. 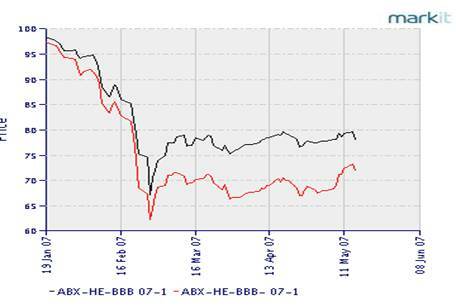 It shows the A-rated credit derivative index which has not recovered either. In fact, this index has displayed the same pattern as subprime, especially that slow corrective (a-b-c) rise, which implies the market here too is ‘anticipating continuing large losses.’ Perhaps Chairman Bernanke does not expect it, but reports in the field, credit derivative indexes, and the Federal Reserve Bank’s own research economists are warning of further U.S. mortgage woes. So Where Are The Losses? We are preparing clients for when things do get “ugly.” For more details, visit our website. Starting in July, our monthly Investment Analysis Report will require a subscription fee of $40 a month. Current readers may ‘reserve their seat’ via FeedBlitz for half price ($20 a month).